Bilharzial pulmonary artery aneurysm: A clinical image. Citation: Abdelnaby MH, Almaghraby A, Bilharzial pulmonary artery aneurysm: A clinical image. J Cardiovasc Med Ther. 2017;1(3):8. Though very rare, schistosomiasis is considered to be one of the primary causes of pulmonary artery aneurysm. We were encountered with a 55-year-old male patient with no past medical history except for schistosomiasis. Preoperative echocardiography for non-cardiac surgery accidentally discovered asymptomatic large pulmonary artery aneurysm. A 55-year-old male patient from a rural area in Egypt with no previous past medical history except for a treated bilharzial infection 40 years ago. 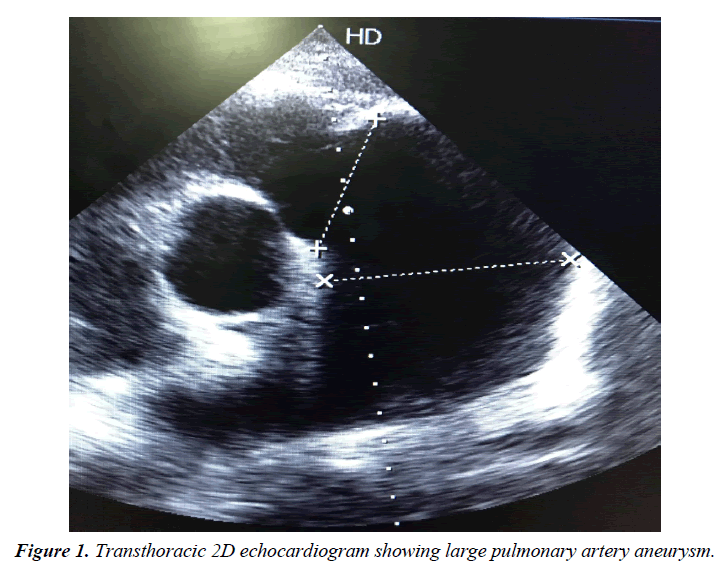 The patient presented to our medical facility for preoperative transthoracic echocardiography for noncardiac surgery that revealed an accidental discovery of a large pulmonary artery aneurysm measuring 12 cm with spontaneous echo contrast inside with no evident thrombi. The patient was asymptomatic with slightly elevated renal functions so, he refused to do any further investigations and was discharged on oral anticoagulation. Pulmonary artery aneurysm is an exceedingly rare finding which is directly attributed to Schistosoma mansoni parasitic infestation which is endemic in Egypt. Pulmonary artery aneurysms are commonly associated with thrombus formation. So far, the management of pulmonary artery thrombus is only through proper anticoagulation and follow-up with a very limited role for surgery (Figure 1). Figure 1: Transthoracic 2D echocardiogram showing large pulmonary artery aneurysm.